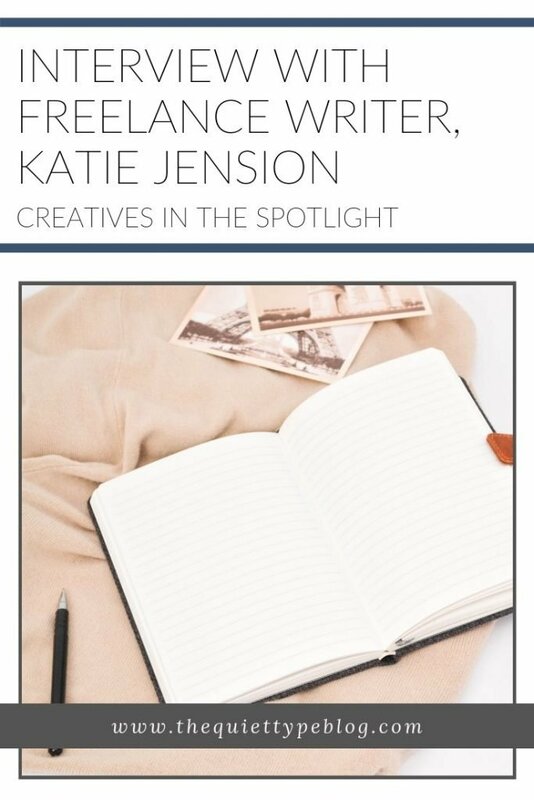 Welcome to our very first Creatives in the Spotlight interview! 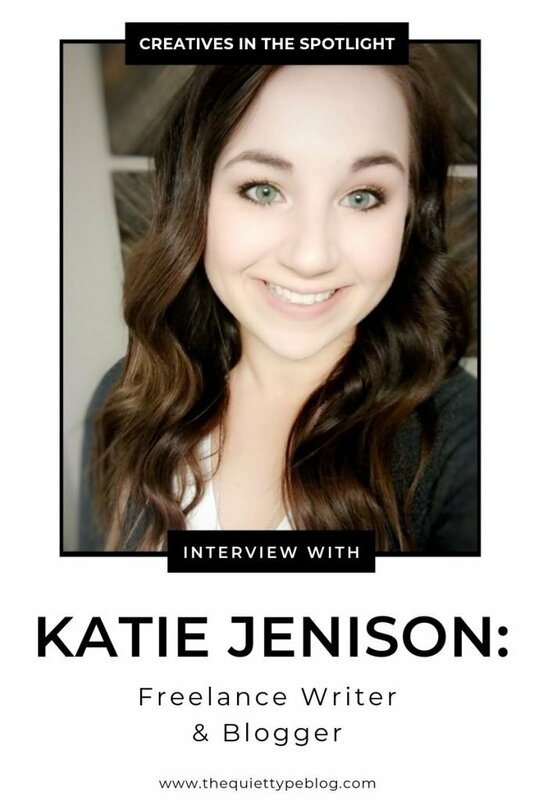 In this interview Freelance Writer and Blogger, Katie Jenison, talks about her journey as a creative entrepreneur. Read all about what inspires her, how she handles challenges, and her advice to aspiring entrepreneurs. I am a freelance writer specializing in copywriting and content marketing for the housing industry. My clients include real estate agents/brokers, property management firms, home builders/remodelers, and interior designers and I create content for their business that connects them to their target client, positions them as an industry expert increases engagement, and drives sales. 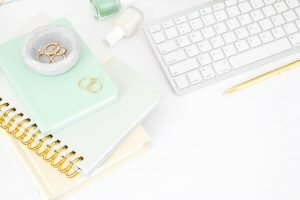 Primarily, I write blog posts and website copy for my clients but I also create content for social media posts, email marketing campaigns, press releases, and print. During my last semester of college, I started to feel really lost. I had no idea what I wanted to do with my degree. At the time, I was working a job I really enjoyed and I didn’t want to leave it for something I wasn’t passionate about. As graduation grew closer and closer, I had to take a really hard look at where I wanted my life to go. One thing that was always really consistent was my desire to create a work life that I loved and allowed me the freedom that only comes from being your own boss. So, I started brainstorming different ideas and exploring areas of my life that I was passionate about and out of nowhere, I realized it was writing. From there, I put everything I had into building my business. I’ve always loved reading and writing, but while I was in college I started taking a lot of classes in creative and technical writing. One of the classes I was in was taught by a professor that published a collection of student work ranging from six-word stories to nonfiction essays. She encouraged me to submit something that year and even though it was way outside of my comfort zone, I did it and was surprised to find out the committee liked my work and published it. After that, I started to get more comfortable writing for other people. When I started freelancing, I was writing anything and everything. Whatever I was offered, I took. After a while, I started to feel really burned out and I wasn’t finding the quality clients that I had always dreamed of. That caused me to really examine my business and what I wanted from it, and I knew I needed to niche down. I still write for a few different industries, by my focus is on copy and content writing for the housing industry because I have a background in it. I officially became a full-time freelancer in October 2018. Prior, I held various positions within the housing industry, first as a leasing agent and property manager, then as the office manager of a flooring store, and finally as the collections manager for a property management company. Yes, I attended college at North Dakota State University in Fargo, ND. I originally planned to get a degree in business but changed my major to English Studies after a few semesters. So, I graduated in 2017 with a BS in English Studies with a Sociology minor. I think I did without really knowing it. I knew growing up that I wanted to be a leader and have the freedom to live my life the way I wanted. At the time, I don’t think I realized that meant pursuing entrepreneurship. Once I figured it out though, it was all systems go! I’ve learned a lot of lessons since I started freelancing, to be honest. There’s definitely a learning curve! I was undervaluing myself. Initially, I was using Upwork to find clients, which was really difficult and when I finally won some contracts, the pay was basically peanuts. After a while, I quit Upwork and was lucky enough to be introduced to my first client through a friend. I was able to charge significantly more working with him, but I quickly realized my rates were too low. Once I knew that I was able to set rates that reflected my work and my time. Always be prepared. I once had a call with a potential client set up and I got sidetracked and ran out of time to do the preliminary research I normally do. When the potential client asked me a very specific question, I wasn’t prepared to answer. Now I set aside time before every meeting to get prepared. Get on top of your finances. 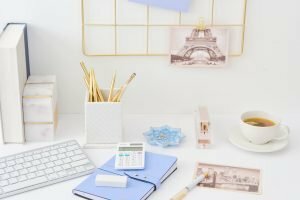 I met with an accountant for the first time about six months into freelancing. While I wasn’t too far gone, it should have been one of the things I did right away. She was able to help me sort out my financial goals, explain self-employment tax procedures, and help me figure out what sort of expenses to track for taxes. I had this fear that I would be going through this journey alone and without guidance, but I couldn’t have been more wrong. The entrepreneur community, particularly the female entrepreneur community, is so welcoming. Time and time again, I’m invited to join Facebook groups where other creatives band together to offer advice and act as a sounding board for one another. Entrepreneurship is a roller coaster of up and down moments. There are times when you’re going to feel on top of the world and then there are times you’re going to feel like you have no idea what you’re doing. Whether you’re feeling like a failure, scared of doing something you’ve never done before, or stuck in a creative funk, you have to push through it. When you’re feeling down on yourself, it can be so tempting to just pack it in and call it quits but giving up won’t get you what you want. Doing the things that challenge you are how you grow and when you come out the other side, you’re going to wonder why you ever doubted yourself. Imposter system is definitely real! I do my best to not let myself get bogged down in negative thoughts or with comparing myself with what other people are doing. One thing that I’ve done since the beginning is keeping an email folder called “Cheerleading.” Whenever I get a testimonial from a happy client or someone emails me telling me I’ve inspired them, I put it in that folder. Then, when I’m feeling down on myself I look through them and remind myself that it’s just a phase I’m going through. The flexibility, hands down. I’m able to be selective about the clients and projects I take on, work from anywhere with a wifi connection, and set my own schedule. Hanging out at home, makeup-free and in sweatpants all day ain’t half bad either! My initial plan leading up to my college graduation was to become a real estate agent, so I think that’s what I would be doing now. Financial freedom – I would like to be debt free by the time I’m 35 (6 years from now) and with student loan debt looming over my head, that’s a pretty lofty goal! In addition to that, I want to have the ability to give where it’s needed. Having a positive impact on my clients and my audience. Nothing makes me happier than hearing how happy my clients are with my work or that my blog has inspired other creatives. I do what I do because I love it and I didn’t feel like I was living up to my potential in my previous jobs. Through freelance writing, I’ve created a life I’m proud of and truly enjoy. I have a lot of big goals for 2019 but there are three in particular that would make me feel like the year was a success. I’m going to go for the super cheesy answer here and say my #1 role model is my mom. She’s always been such an inspiration to me but our family went through a very dark period in 2014 when my brother passed away due to a motorcycle accident and I saw a whole new side of her. Despite suffering a major loss, she got our family through it and kept it from splintering more than it already had. She’s truly the strongest person I know and I am so grateful for her. Elna Cain and Jenna Kutcher are also sources of inspiration for me, though! My boyfriend, Danny. We’ve had a lot of big changes in the last year or so. We both quit our jobs to move to a new state, he was hired by a company willing to train him and pay for schooling for his desired field, we bought a house, I took a new job and quit it within 4 months. Without his patience, understanding, and support I don’t think I would have finally taken the leap and pursued freelancing full-time. My friend, Beth. We’ve been friends since we were in diapers and I think she has by far, been the most excited person about my business journey. She’s referred clients to me, cheered me on, and given me countless pep talks. My very first “real” client, Mike. Throughout the year and half that we’ve worked together, Mike has been extremely helpful when I have business related questions or just need someone to bounce ideas off of. He’s also very generous and is one of my biggest sources when it comes to referrals. Just relax! Most of the time you can find me reading or watching Friends. A little of both, actually. I’ve always been very quiet and prefer quiet nights in or hanging out with close friends but over the years I’ve started to become a little more extroverted, which has a lot to do with my business. I think there are benefits to both. The introverted side of me likes to observe and be prepared for most situations, which helps me out with the client side of things while the extroverted side of me helps me do intimidating things like cold email people I’d like to work with or attend networking events. Typically, I like to work in the morning but lately, I’ve found myself more productive during the late afternoon and evening. My #1 tip for staying productive while working from home is batching content. I tend to procrastinate, especially when I feel overwhelmed. Batching content helps me prioritize tasks and break them down into steps that I can execute fluidly. 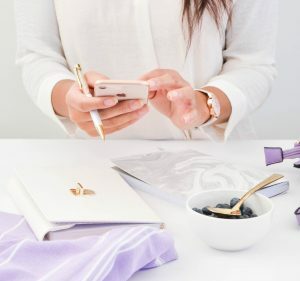 This is a toss up for me…I’m a big fan of Google Drive to keep all of my things in one place, but if I had to pick just one thing it would probably be Grammarly. I have the chrome extension and use it for basically everything. It catches spelling and grammar errors, as well as any sentence structure issues. I also really like that it tracks my stats so I can see how many words I write per week. It’s a reminder that the only way to get over your fears is to face them head-on. Once you do something that scares you, you take away the power it held over you. My favorite business podcast is Jenna Kutcher’s Goal Digger Podcast, but my one true love when it comes to podcasts is true crime! My favorites are Crime Junkies and Swindled. Hands down, I would say You Are a Badass by Jen Sincero. I know it gets hyped a lot, but it’s for a good reason. This book helped me look at life a lot differently, particularly how I think about and react to things. Do you have a favorite blog?